Job site signs printing on one of our flatbed printers. With more than 20 years in the sign, graphic, and digital printing trades, we have learned a thing or two about graphic production—and the important role wholesale contract production plays in our industry. We understand the needs of outsourcing large format digital print production and finishing services. Take advantage of our equipment investment, knowledge, and our attention to detail to free up your time and grow your profits. 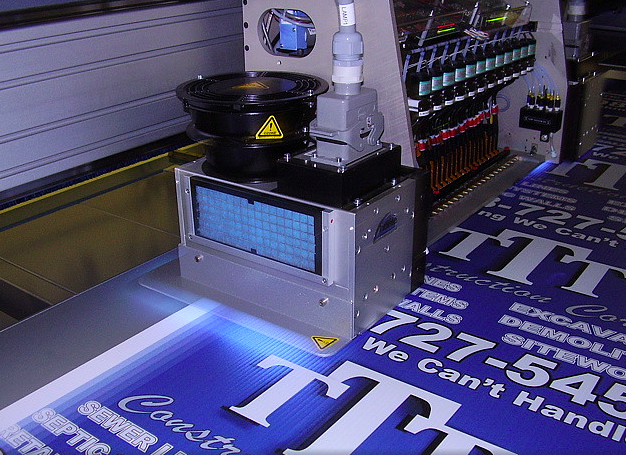 We’re a New Jersey large format print and sign shop with on site, hands-on ownership. We love to be super served and do our best to return that level of service at every step of the way. We know your time is valuable and your clients are exacting—we pledge to work hard to save you time, money, and hassle–and to impress your clients with great large format print quality. We’re technically and practically capable in all aspects of large and grand format digital graphics and dimensional sign production. We’re often busy plugging away at printing 3M controltac van wraps, oracal contour cut decals, UV flatbed direct printed PVC or coroplast POP pieces and printed and layered lobby logos! We’ve successfully completed projects for industry partners as diverse as printing 150 straight truck wraps on 3M Controltac to 100,000 1mm Sintra printed and router cut POP pieces, to direct printed doors, life size cutouts and standees of the President, big heads for ESPN, backdrops for MTV, Fuse, CMT and even floor graphics and acoustical ceiling tiles. There are few substrates we can’t print nor projects we can’t handle. Should you have any questions please feel fee to email or call us today.